Vigilante justice at its best? Nobody ever, ever messes with The Punisher! Comes with a Spider-Man pinball machine, bar wall, and tortured informant. Action figure based on the character by artist Tim Bradstreet and writer Garth Ennis. Vigilante justice at its best? The second release in the Marvel Select line of highly detailed action figures is created especially for collectors. 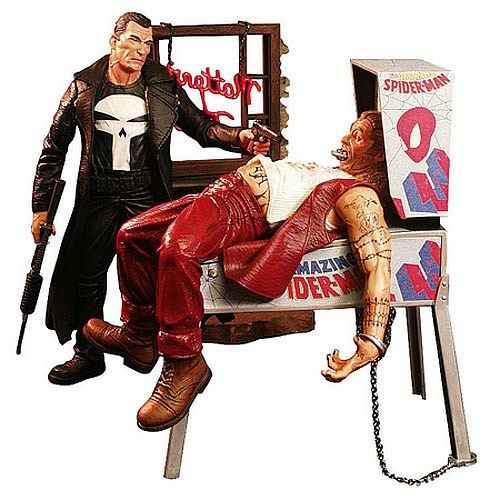 This 7-inch tall Punisher Action Figure comes with a diorama. Based on the version of the character made popular by artist Tim Bradstreet and acclaimed writer Garth Ennis, it's incredibly detailed to resemble the comic book character in three dimensions. This figure is sculpted by Steve Kiwus and comes complete with Spider-Man pinball machine, bar wall, and tortured informant. Order yours before The Punisher comes gunning for you! When his family was killed in the crossfire of a Mafia shootout, Frank Castle put his military training to use - waging a one-man war on crime. As the Punisher, Castle reinvented himself as the merciless scourge of the underworld. The mere mention of his name causes criminals everywhere to cringe in fear, because they all know the Punisher plays for keeps and someday, he may come gunning for them! A seasoned combat veteran of exceptional skill, the Punisher possesses the normal human strength of a man his age, height, and build who engages in intensive regular exercise. A former U.S. Marine captain with a distinguished combat record who has undergone SEAL (Sea Air Lane), UDT (Underwater Demolition Team), and LRPA (Long Range Patrol) training, Frank Castle is well versed in the arts of warfare and hand-to-hand combat.